The Coordinated Land Use Planning Review has wrapped up and the four provincial plans have been updated and released. These updated plans contain policies on the Agricultural System, a region-wide system that supports the consistent protection of farmland and the agri-food sector’s viability. 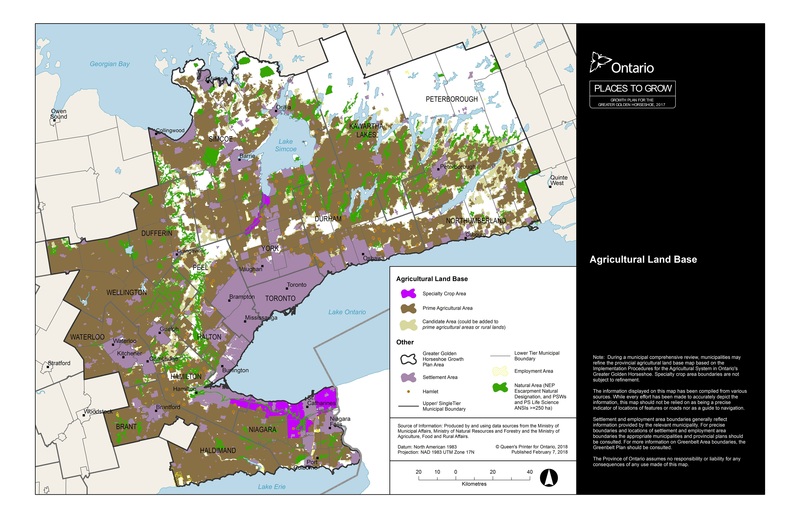 Ontario Farmland Trust (OFT) provided the Province with recommendations that fall under three broad themes including the need for firm agricultural system boundaries, LEAR methodology, and additional support for municipal decision makers. 1) OFT recommends the Province provide further clarification on ‘minor refinements’ within prime agricultural areas to ensure that the Agricultural System remains continuous across the GGH in the long-term. 2) OFT recommends that the Province ensures the Agricultural Land Base boundaries are firm to prevent uncertainty and allow the Agricultural Land Base and the businesses and culture therein to thrive. 3) OFT recommends that OMAFRA encourages municipalities conducting local LEARs to consider agricultural potential as a factor within the refinement process. 4) OFT recommends that OMAFRA encourages municipalities conducting local LEARs to consider culture as a factor during the refinement process. 5) OFT calls on OMAFRA to ensure that LEAR methodology be reviewed and updated when necessary to address the direction of provincial policies and that these updates be released to municipalities to ensure they make informed land protection decisions. 6) OFT recommends that the Province update the Agricultural System Portal on a timely basis. 7) OFT recommends that data sets used to inform the portal are made accessible to single, upper, and lower tier municipalities to ensure they are able to implement this system into current planning practices. 8) OFT recommends that the online portal focus on a provincial scale to ensure that changes are consistent and municipalities can use the data when considering planning decisions that cross multiple municipal and regional boundaries. OFT appreciates the Ontario Ministry of Agriculture, Food and Rural Affairs’ dedication to supporting agricultural viability and protection in Ontario. OFT has played an active stakeholder role within the Coordinated Land Use Planning Review consultation process since 2015 and is pleased to continue to work with the Province to strengthen the Agricultural System’s products, implementation, and supportive tools as they are developed.